Inflatable golf products have developed more quick these years. 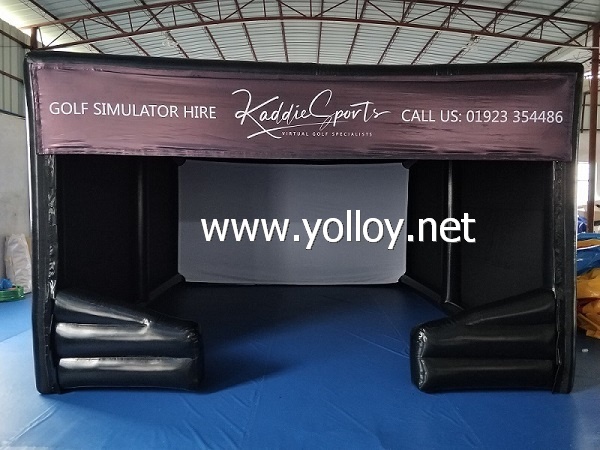 And the inflatable golf simulator room is one of the most popular product in our company, it help to refine players’ skill in the key components of golf: Driving, pitching, putting. Our inflatable golf tent help the golfer and trainer identify and refine the smallest of details in your swing. Our putting ranges help you keep your score down by improving accuracy and ability. As an inflatable item,you can set it up anywhere as you want,since it very protable too. We can print your logo, slogan or other messages on the tent. Just give us your idea or design, and we will make it to the real inflatable product! It is included inflatable games,blower, kit bag( including the same colors material, glue), ground sheet. 2.What about size and color? 3.Can you design one specially? 4.What kind of guarantee you serve? Normally ,if you use the tent in correctly way,Our inflatable items can be used for many years. If it is damaged, and we will assist you how to use the glue and material to repair it. We will send a kit bag for every inflatable products. 5.Do your air pump meet CE/UL requirements? Our air pump have passes the certificate of CE, UL.